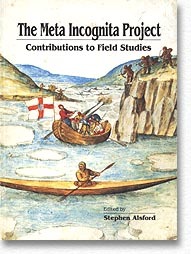 he Meta Incognita Project investigates Martin Frobisher's Arctic expeditions of 1576-78 (which included the first English attempt to establish a colony in Canada and to mine its mineral resources) and their effects on the culture of the Inuit he encountered. The project is also aimed at ensuring the long-term protection of the historic sites associated with these expeditions. Although the voyages are well documented in contemporary official records and personal accounts, this evidence presents only the Elizabethan perspective and leaves unanswered intriguing questions, such as why Frobisher and his backers believed there was gold in ore that was actually worthless. The project seeks a fuller understanding of this episode in the history of European exploration of the New World through archaeological data, Inuit oral history, and further archival studies. This progress report, focusing particularly, but not exclusively, on field investigations conducted in 1991 and on the analytical work supporting them, comprises papers by Canadian and American archaeologists, anthropologists and geologists, as well as other scientists engaged in the project. Besides the preliminary findings from their work, the papers present an introduction to the historical context and to the problems and questions facing researchers. 17.8 x 24 cm, 228 pp.